Below is a look back at the amazing work of our local chapters in 2016. It has been a humbling and inspiring year. Thank you for your support! Critical Resistance organizes at the grassroots level through our local chapters and also as a national organization. CR’s campaigns, projects, workshops, and public events are dedicated to making abolition common sense and practical. We have developed and amplified tangible abolitionist reforms that fight and erode systems of policing and imprisonment. Because the PIC segregates and isolates individuals, communities, and movements from each other, we know that chipping away one piece at a time can only be successful if we build stronger, deeper, and wider alliances as we go. Our work includes research, report writing, media and communications, outreach and advocacy, and coalition building. We can create, lift up, and vitalize solutions as we tear down walls, cages, and policing—with your support. Help us build toward liberation in 2017. Could you make a generous gift today? Thank you for your continued investment in Critical Resistance. Download a version of this update here. 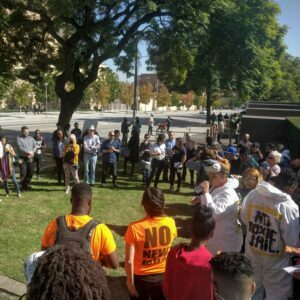 CR-Los Angeles (CR-LA) and the LA No More Jails coalition are in the thick of the fight to stop construction of a women’s jail at a former ICE detention center on toxic land in Lancaster, a high desert town far from the LA communities where most imprisoned people in the county live. In the face of a Sheriff’s Department that shamefully claims the new county jail would be a “treatment-oriented facility,” CR-LA and the LA No More Jails Coalition are debunking the logic that sheriffs are legitimate treatment providers for Black, brown and poor Los Angelenos. We know that putting “services” inside a jail is coercive and inhumane; jails never have been and never can be health centers nor service providers. Instead, we are highlighting and demanding positive solutions that actually work for women and communities in LA County: life-affirming mental health and substance use treatment and services, supportive housing, employment opportunities, and sustained connection with their families in their communities. 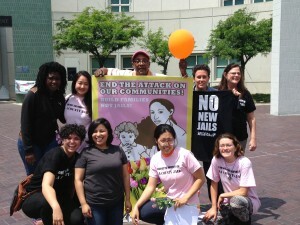 CR-LA has fought jail expansion in LA for over a decade, and this campaign against a proposed new women’s jail has been our focus for the past four years. 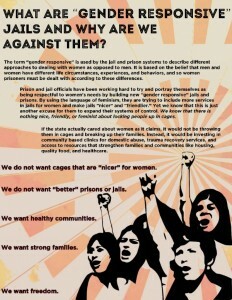 CR-LA members have been leading outreach, media, and messaging for the fight, reaching thousands of people and making the proposed new women’s jail plans a county-wide controversy. CR-LA recently produced a video, “5 Reasons Why LA County Doesn’t Need a New Women’s Jail!”, which succinctly challenges the legitimacy of jail expansion being positive for women. The video features community members as experts on the impacts of jailing, the need for life-affirming resources and diversion plans, and the toxic environmental and health hazards of the jail plan. This year has been full of action. 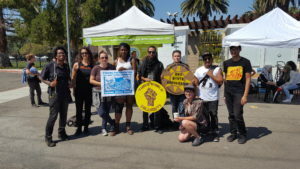 In the first half of the year, CR-LA spearheaded opposition to the project on environmental grounds, exposed the toxic impacts of the new jail, and also helped form Antelope Valley People’s Coalition, a new anti-jail coalition based in the region where the new jail would be built. In October alone, we organized two mass mobilizations to stop the state from approving this hazardous plan. Early in the month we won a two-week delay of the project due to our powerful advocacy, tireless pressure, and expert testimony from people imprisoned in Southern California. Yet at the following hearing on October 25th, the County Board of Supervisors once again showed that they do not serve the interests of the people. After shutting out the public, the Board voted to approve the controversial environmental review and ignore the hazards of the toxic site. Despite this setback, we will continue to fight against jail construction and the bold-faced lie that a new jail on toxic land could ever be a life-affirming “treatment center” for women. 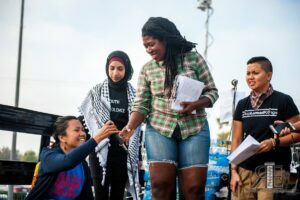 Your support has helped us build a strong LA No More Jails coalition, develop powerful leadership, create community reports and resources, and foster greater unity against jail construction in Los Angeles. CR New York City (CR-NYC) has been growing steadily, building correspondence with hundreds of imprisoned people in the Northeast and Pennsylvania regions, and contributing to abolitionist common sense in New York. In September we hosted over 300 organizers and activists at “The Hard Road to Abolition// Strategies to Win,” an event in our Profiles in Abolition series that inspired us to think deeply about the opportunities that abolition creates. 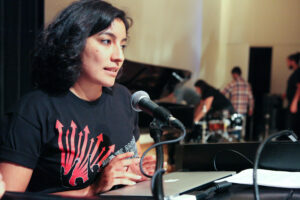 The event also served as a launch for the first issue in a new zine series based on CR-NYC’s Attica Interview Project. The first issue, available online and in print, outlines the history of Attica and details prisoners’ reflections on organizing inside and their visions for a NY without prisons. Upcoming issues will cover other histories of prison reform, prisoner resistance, and amplify former prisoners’ visions for social transformation. As CR-NYC is campaigning for decarceration in NY, we are also shifting the political landscape nationally. 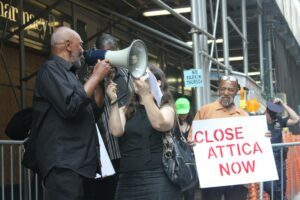 On the 45th anniversary of the Attica rebellion, CR-NYC spearheaded an action with the Beyond Attica coalition demanding that Governor Cuomo close the notorious prison in upstate NY. The rally, held outside Cuomo’s NYC office, featured people formerly imprisoned at Attica, youth organizers, family and community members and was endorsed by over 20 organizations. The action hit the mainstream when MTV News featured the rally messaging and posters created by CR-NYC to accompany a provocative conversation on prison abolition, again demonstrating the ways that CR’s abolitionist politics, messaging, and campaign agendas push the boundaries of the abolitionist reforms, changes, and goals we imagine are possible. CR-Oakland (CR-OAK) is fighting on the hard road to abolition against jail expansion and the violence of policing with campaigns and projects that have been years in the making. 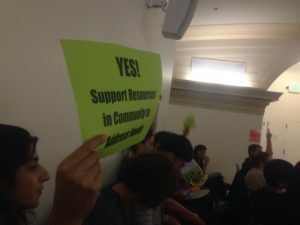 Last year CR-OAK and the No New SF Jail coalition successfully defeated the proposal for a new jail in San Francisco at 850 Bryant St. Now we have been focused on making sure that new proposals to build a smaller replacement jail or a locked mental health facility—a jail by another name—do not move forward. 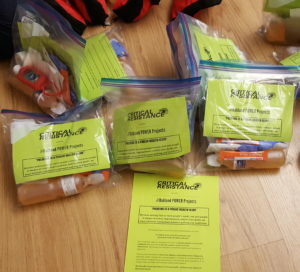 To this end, CR developed a popular educational resource, “8 Steps Toward a Jail-Free San Francisco,” which has been used by decision makers as a tool to evaluate alternative proposals to a jail, and contributed to “The San Francisco Community Health Initiative,” a comprehensive people’s plan that prioritizes meeting social and economic needs as solutions to ending imprisonment. On October 28, this year’s hard work paid off when the “Alternatives to a Jail Rebuild” community-city workgroup rejected the Sheriff’s two “mental health” jail proposals and endorsed non-jail alternatives instead. 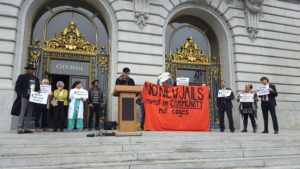 We will continue to pressure the County Supervisors to ensure that our victories are not undermined and that no new jails are constructed in SF, especially in the name of health and treatment. For over three years, CR-Oakland has been part of a national and regional effort to end Urban Shield, a law enforcement, military and emergency services program that trains police in using militarized tactics and weaponry under the guise of “emergency preparedness.” A co-founder of the Stop Urban Shield coalition, CR-OAK plays a role in the core strategy team, media, action planning, and outreach teams. This campaign is a powerful demonstration of abolitionist common sense: whether for emergencies or daily life, we must invest in health and wellbeing and divest from policing. We’ve successfully exposed this as a sheriff’s program that uses public funds to militarize local police and co-opt emergency service resources for warfare, and we are now campaigning to stop the existence of the Urban Shield expo entirely. 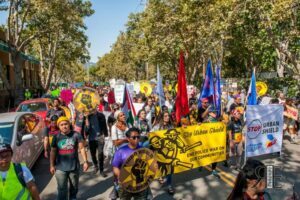 On September 9th, CR-OAK and the Stop Urban Shield (SUS) coalition held a vibrant action, live-streamed across the country, to disrupt this year’s war games and weapons expo. 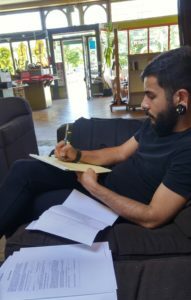 With hundreds of participants, excellent coordination and powerful spokespeople, we shut down one of the trainings and won media coverage in over 45 articles. We are building on this powerful day of resistance and pressuring decision-makers to defund the program. CR-OAK is sustaining diligent outreach and mobilizations with the SUS coalition, activating community members to speak out at the Board of Supervisors meetings, and educating the supervisors about their power to redirect funding of SWAT and military tactics toward healthy and life-affirming emergency preparedness. CR-OAK has also spent the year honing our first Oakland Power Project, an alternatives to policing initiative that is building out concrete ways to invest in health and divest from policing. In addition to playing a critical expert role in the Stop Urban Shield campaign, the Anti-Policing Healthworkers Cohort facilitated over 15 “Know Your Options” workshops to Oaklanders on how to intervene in situations of physical or behavioral health crisis without calling 911 and how to act as a healthcare advocate if the cops arrive with 911 or are present at a medical clinic or hospital. Through their increased organizing, workshops and popular educational tools, they are shifting common sense to understand that policing is a health hazard which we can oppose and decrease. 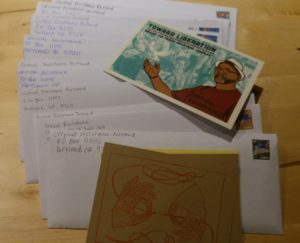 After a year and a half, CR Portland (CR-PDX) has established itself in the local community with a prisoner mail program, an Anti-Policing Community Conversations series, dozens of workshops and regular participation in mobilizations. We also recently established office space at In Other Words bookstore, which builds the chapter’s infrastructure and enables us to strengthen collaborations with other social justice organizations! In 2016 we grew our capacity to launch an anti-policing campaign: we trained and developed our members’ skills in workshop facilitation, campaign tools and planning; we carried out campaign research; and we strengthened alliances with community partners. Our research and analysis topics include Portland’s policing structures and budgets, changes to police protocol, the impact and reach of the police union, the violence of policing against community members who have mental health needs or are homeless, and current mental health service options in Portland. In all, we’re thrilled to be building up Portland communities to resist policing and make inroads to decouple healthcare from the cops. We appreciate your steady support as CR-PDX builds its capacity and advances on the road to abolition. Please help us continue to make abolition common sense, shift who is recognized as a movement expert and amplify abolitionist reforms. We can create, lift up, and vitalize solutions as we tear down walls, cages, and policing—with your support. Help us build toward liberation in 2017. Could you make a generous gift today? Thank you for your continued investment in Critical Resistance!